Freckles are caused by an increase in melanin pigment in the melanocytes. They are seen in sun-exposed areas of the skin, usually in fairer skin types (Fitzpatrick types I - III). Commonly occurring as a sign of photoageing, they may also be seen in younger age groups, especially in those with fair skin. The sites involved include, the nose and malar area (most common sites), forehead, and the dorsum of the hands. A prospective study on the treatment of freckles was carried out for a period of one year, from January 2011 to December 2011, among patients who visited the Outpatient Department of Dermatology. All patients having freckles on the face, excluding those who were pregnant, lactating and had a keloidal tendency, were included in the study. The patients / guardians of the patients were informed about the aim of the study and the possible side-effects. History with regard to duration of the lesions, photosensitivity, family history, occupation and hobbies in relation to excessive sun exposure was noted. Clinical history was noted with respect to previous therapies, current dermatological treatment and regular or intermittent use of sunscreens. The tendency to develop hypertrophic scars and post-inflammatory hyperpigmentation was also noted. Pre-treatment photographs were taken. The patients were advised to stop all other topical treatments, to use only sunscreens and to avoid excess sun exposure. The face was divided into five cosmetic units - the forehead, nose, right and left malar areas, including the cheeks and the chin. Fifteen patients were treated unit-wise and five were treated in toto as the freckles were few in number. They were reviewed at weekly intervals for three weeks and the improvement was assessed both objectively as well as subjectively. The patient was asked to evaluate the lightening of pigmentation on either side. Indian skin falls in fitzpatrick III-IV type. A total of 20 patients, of Fitzpatrick type III-IV were treated. Interestingly, they were all females. They were in the age group of five to fifty years. Of the 20 women, 16 had involvement of the malar area (the most common site of freckles), 11 had involvement of the nose, five had involvement of the forehead and three had freckles on the chin. The mean duration of the freckles present was 10 years. The skin was cleansed with ethyl alcohol. TCA and phenol were applied as spot peels on the freckles with the help of a toothpick. Freckles on the left side of the face were treated with phenol (80%), while those on the right side of the face were treated with TCA (70%), in all patients. Frosting of the skin was taken as the end point of the treatment. The patient was instructed to wash the face with water after six hours and not to pick on the scabs. The patients were reviewed on the seventh, fourteenth and twenty-first day after treatment. Photographs were taken on each review visit, to compare them with the pre-treatment photographs and assess the improvement. Out of the 20 patients, 15 came for regular follow-up. Among these patients, 10 were of fair complexion (Skin type III), while five were of wheatish complexion (Skin type IV). Those with very fair skin had complete clearance of the lesions on both the sides. Out of a total of 15 patients, 11 had complete clearance of the lesions (90 - 100% lightening) on both the sides [Figure 1]. One patient had only 20 - 50% lightening of the lesions on the right side, with clearance of lesions on the left. One noted a recurrence on the side where TCA was applied. Two patients developed post-inflammatory hyperpigmentation on both sides (darker skin types). Both TCA and phenol cause a burning sensation on application which is self-limiting. 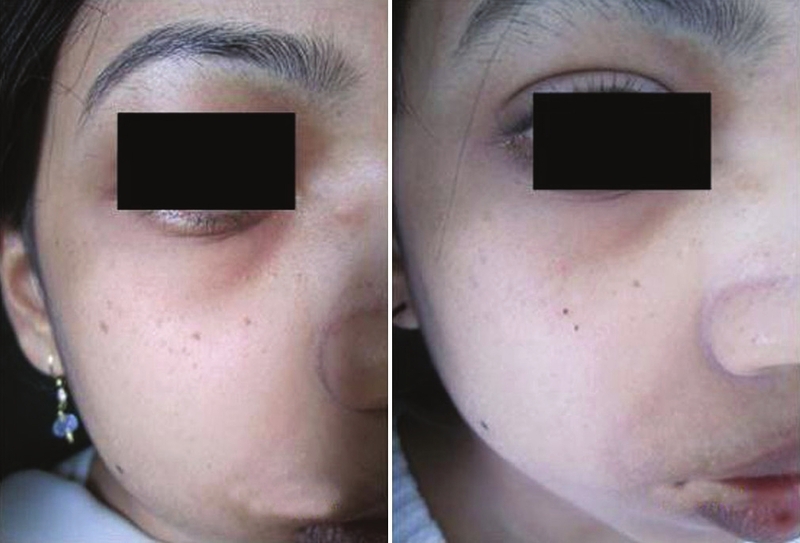 TCA caused more immediate erythema and edema as compared to phenol. The scab that formed after treatment remained for about a week. The scab retention time was shorter on the side where TCA was applied [Figure 2] and [Figure 3]. On the first review visit, that is, on the seventh day itself, complete resolution of the lesions was noted. The freckle seemed to have peeled off along with the scab. This was assessed by comparing them with the pre-treatment photographs. In many patients, the side treated with phenol showed hypopigmentation on the first review, which was transient, as noted on the subsequent review visits. Both TCA and phenol were not effective in the treatment of freckles in darker skin types (type IV) resulting in hyperpigmentation. This may be attributed to the tendency to post inflammatory hyperpigmentation, as well as excess sun exposure. This hyperpigmentation was treated with a series of chemical peels and subsided over time. 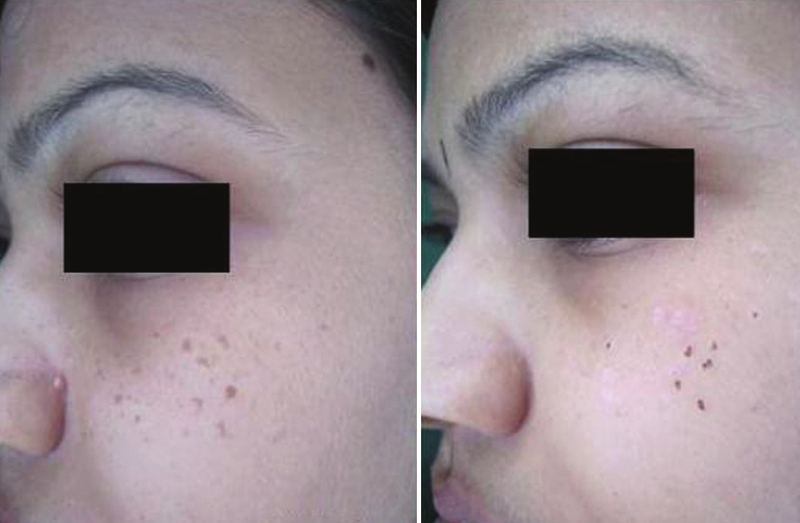 A subset of patients among these was found to have only peri-lesional hyperpigmentation, with the freckles having cleared [Figure 4]. The exact cause for this is not known. In such patients, a post procedure topical corticosteroid cream may help mitigate this problem. However, in fair skin types II - III, the efficacy of both these agents in the treatment of freckles was comparable, with complete resolution of the lesions [Figure 5]. 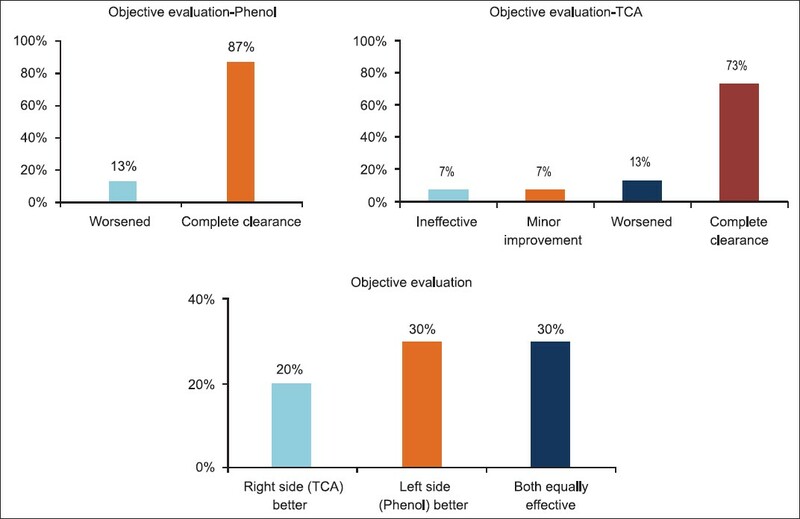 Phenol seemed to have a marginal edge over TCA in completelylightening the freckles, as per both subjective and objective assessment [Figure 6]. As this was a pilot study and the sample size was small, the t-test was applied to assess if there was any significant difference between the effects of the two chemicals. It was statistically proved that there was no significant difference between the two, that is, both the chemicals were equally effective. The calculated t-value was 0.54. The t-table value at 5% level of significance at 14 df was 2.145. The treatment of freckles is purely for cosmetic reasons. If treated appropriately, the look of a patient improves considerably as the freckles are situated on very prominent and cosmetically important units like the nose and malar areas. TCA (70%) is caustic. It causes precipitation of proteins and necrosis of cells in the epidermis. This is visible as white frosting. The depth of destruction of TCA depends on the concentration. At a concentration of 70%, it acts as a deep peel (mid reticular dermis according to Brody's classification). The necrotic layers slough off and re-epithelisation occurs. Thus, the superficial layer of pigmented skin is destroyed and replaced with more 'normalised' tissue, improving the cosmetic result. Phenol (88%) acts as a kerato-coagulant, causing instant vascular coagulation and immediate coagulation of the epidermal keratin proteins. This prevents its further penetration into the dermis. At a concentration of 88%, it acts as a medium depth peel causing injury to the upper reticular dermis (Mark Rubin's classification). As the superficial layers peel off in the form of a scab, the wound heals by migration of keratinocytes from the adjacent skin. Phenol has an additional action on melanocytes, that of inhibiting melaninisation, according to a long-term follow-up study conducted by Kligman et al., on phenol face peels. They have concluded that the bleaching effect of phenol is not due to destruction of melanocytes, but due to impaired melanin synthesis, which is very long lasting (up to 20 years or even more). The long lasting effect is explained on the basis of evidenced anti-proliferative activities of phenolic compounds against melanocytes. Phenols are categorised as peroxidase inhibitors, acting during active melanin synthesis. The inhibition of peroxidase results in depigmentation or actually hypopigmentation, by a reduction in the polymerization of melanogenic intermediates. , Therefore, phenol bleaching effects result from melanopenia and even dispersion of fine melanin in keratinocytes. This may be the cause for the overall better effect observed with phenol, as well as the transient hypopigmentation. Although the exact cause of hypopigmentation in these cases is not known, it may be similar to that seen in the chemical peels - due to sloughing of the epidermis and removal of excess melanin. In medium depth peels, with removal of the basal layer, the hypopigmentation is more prolonged, till the melanocytes migrate from the surrounding area. Complications such as hyperpigmentation and hypopigmentation were noted in the study. In skins with a tendency towards hyperpigmentation, either hyperpigmentation was seen on the first review visit itself, or initial hypopigmentation could be followed by hyperpigmentation, which was seen as the freckle reappearing or appearing larger in size after treatment. In such skin types, both the agents were not effective, with hyperpigmentation noted on both sides of the face. Hypopigmentation was noted in two cases. No depigmentation was noted in any of the cases. The hypopigmentation lasted for about two weeks. Both the chemicals need to be handled with extreme caution, especially near the face and eyes. There is a risk of excess chemical accidentally dripping from the toothpick over the uninvolved skin, beyond the border of the freckles. Application near the eyelids and creases must be avoided. The scab formed is darker than the freckles itself, so adequate counseling needs to be done, to inform the patient about the sequence of events, to avoid alarming the patient. The scab is present for about a week. In the absence of instant results, patient satisfaction is less. Colour mismatch may be present for about two weeks in a few cases - either hypopigmentation or hyper pigmentation. The procedure can be individualized according to the size and shape of the freckles. Better manual control for application using a toothpick as compared to laser beams that have to be aimed from a distance. These usually have a red guiding light that obscures the visibility of the freckle being treated. It is faster and clinically superior when compared with the cryotherapy method, as a contact time does not have to be maintained. The chemicals are cheap, easily available and have a long shelf life. This study was done to assess the efficacy of the two chemicals, TCA and phenol, in the treatment of freckles on the face. To our knowledge, no other study has compared these two modalities for the treatment for freckles. Both TCA (70%) and Phenol (80%) were found to be effective in the treatment of freckles in fair skin. The advantages are many, as already mentioned herewith, and these translate into a better, cost-effective, yet effective treatment for the patients. 1. Savant SS. Superficial and medium depth chemical peeling. In: Savant SS, editor. Text book of dermatosurgery and cosmetology. 2 nd ed. Mumbai: ASCAD-Mumbai, India; 2008. p. 177-95. 2. Chan HH, Fung WK, Ying SY, Kono T. An in vivo trial comparing the use of different types of 532 nm Nd: YAG lasers in the treatment of facial lentigines in oriental patients. Dermatol Surg 2000;26:743-9. 3. Todd MM, Rallis TM, Gerwels JW, Hata TR. A comparison of 3 lasers and liquid nitrogen in the treatment of solar lentigines: A randomized, controlled, comparative trial. Arch Dermatol 2000;136:841-6. 4. Savant SS. Chemical cauterization. In: Savant SS, editor. Text book of Dermatosurgery and Cosmetology, 2 nd ed. Mumbai: ASCAD-Mumbai, India; 2008. p. 108-9. 5. Kligman AM, Baker TJ, Gordon HL. Long-term histologic follow-up of phenol face peels. Plast Reconstr Surg 1985;75:652-9. 6. Yáñez J, Vicente V, Alcaraz M, Castillo J, Benavente-García O, Canteras M, et al. Cytotoxicity and antiproliferative activities of several phenolic compounds against three melanocytes cell lines: Relationship between structure and activity. Nutr Cancer 2004;49:191-9. 7. Kasraee B. Peroxidase-mediated mechanisms are involved in the melanocytotoxic and melanogenesis-inhibiting effects of chemical agents. Dermatology 2002;205:329-39. 8. Sezer E, Erbil H, Kurumlu Z, Taºtan HB, Etikan I. A comparative study of focal medium-depth chemical peel versus cryosurgery for the treatment of solar lentigo. Eur J Dermatol 2007;17:26-9. 9. Khunger N. Complications. In: Khunger N, editor. Step by step chemical peels, 1 st ed. New Delhi: Jaypee Brothers Medical Publishers; 2009. p. 288-96. 10. Khunger N. Priming and skin preparation. In: Khunger N, editor. Step by step chemical peels, 1 st ed. New Delhi: Jaypee Brothers Medical Publishers; 2009. p. 67-8.